Browse > Home / Headlines, Life, Science, Weather / WEATHER GEEK: Batten down your Halloween stuff, it’s going to be windy! WEATHER GEEK: Batten down your Halloween stuff, it’s going to be windy! UPDATE 10/25/14 12:45pm: The National Weather Service has issued a High Wind Warning for winds gusting up to 60mph. Get ready Readers, the final weather predictions are in – the storm system that forecasters have been watching for the last few days looks like it will smack into southern Washington as a moderately strong central low pressure this evening. High winds of 25-30mph sustained with gusts of 35-60mph are expected across parts of the Puget Sound region starting from around 5pm this afternoon and lasting until around midnight. The National Weather Service has issued a High Wind Warning for the coast, and Puget Sound interior including Seattle, Bremerton, Bellevue, Tacoma and Olympia. Gale Warnings have also been issued for most of the Puget Sound, the Straits of Juan de Fuca, and coastal waters. 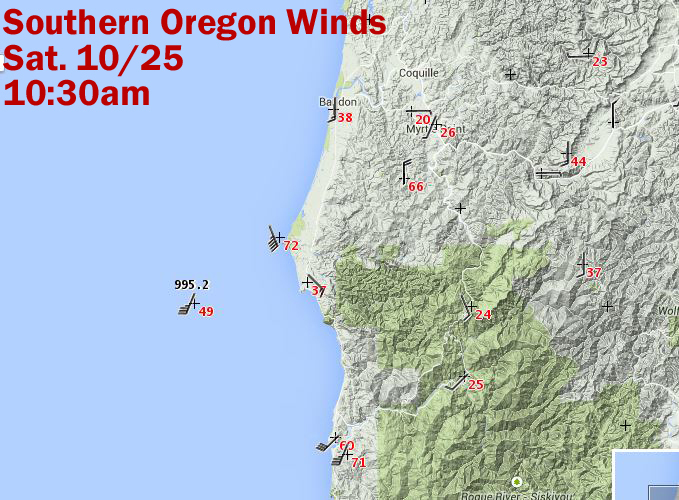 Oregon is already getting smashed this morning; with some weather stations along the coast reading 73mph! That’s nearly hurricane force! 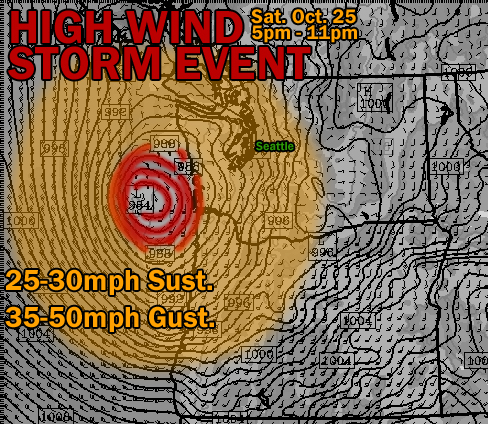 Most of Oregon is going to receive the brunt of the winds in this system. There are High Wind Warnings issued for a large portion of Western Oregon. Localized power outages are possible with this system as many trees still have leaves on them, making them larger targets for falling branches. This will also be a wet system. The Olympic and Cascade mountain ranges could see 2-4 inches within the next 24 hours. Make sure you have your batteries and supplies this evening, and enjoy the stormy weather! The PSWxG Live Stream will be running in storm mode all day today and into the night. I’ll be updating with the newest weather models, and information. Here’s a chat room if you want to chat about this evening’s storm! Puget Sound WX Geek Chatroom!